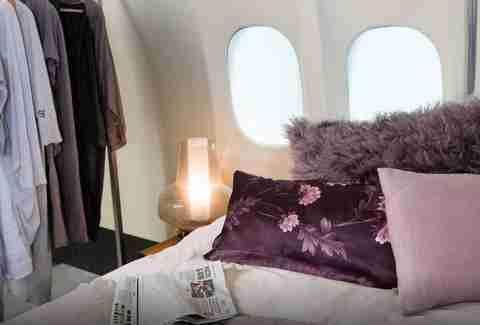 Sleeping on a plane is one thing, but sleeping in a plane is something altogether cooler. 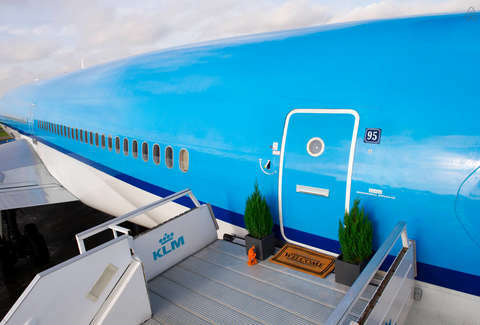 Rather than drooling all over the guy next to you in coach and waking up when the flight attendant kneecaps you with the beverage cart, you can actually shack up inside an airliner, thanks to a joint venture between KLM and Airbnb. Right now, the companies are offering three aviation enthusiasts an exclusive one-night stay in one of the airline’s retired jets, revamped into a swanky pop-up hotel in Amsterdam's Schiphol Airport. Contest winners will pick a date between Nov. 28-30 to stay in the two-bedroom "aircraft loft", which comes with eight bathrooms(! ), two fully equipped kitchens, first-class seats you don’t have to pay extra for, internet, and a TV with a selection of aviation-themed movies like Snakes on a Plane, The Aviator, and, of course,Top Gun. To enter, contact the host on the property’s Airbnb page and explain why you deserve to stay and who you’d bring with you in less than 100 words. A panel of judges will choose the best responses to award free flights to the jet from anywhere in the world. Before you prepare for takeoff, though, note that both you and the plane (which has circled the globe 3,765 times) will stay firmly on the ground. “No flying” is house rule no. 1 (sadly, you won't be joining the Mile High Club), while guests are also asked not to inflate the emergency slide; not to smoke when the non-smoking sign is on; and not to use the jet engines to roast marshmallows for s’mores. You also aren't supposed to drink on board. But you can probably sneak in your own DIY cocktails anyway. Head here for your chance to win.